Ok, I am sick of painting blue so I thought I would take a break. 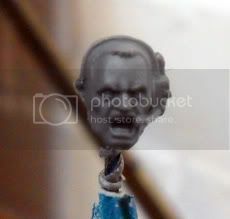 Here is a rough tutorial on how I paint faces using only Tallarn Flesh and Space Wolf Grey. First, I take the head and clean the mould lines using the edge of a hobby knife with a brand new blade. Next I undercoat the head in Black. Now paint the flesh areas with Tallarn Flesh mixed with a little water. This will take 2 coats if you don’t use too much water, to get a solid but smooth colour. I left the recesses on the head with only one coat, so the eyes and around the jaw have a slight shadow to them from the black undercoat coming through. Now i mix the TF with Space Wolf Grey at about 4:1. I leave the recesses with the base coat and use this mix on the exposed areas, such as the forehead, cheeks ears, jaw and chin. Nest i add some more SWG to my mix, about 3:1 now. 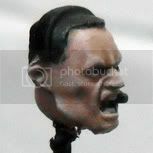 At this stage i am looking at adding highlights to the prominently raised areas on the face, such as the brow, nose, ear, chin, around the mouth and the outer edge of the jaw. The final highlights are done pretty much by feel alone, but first it is roughly 2:1 TF:SWG to pick out the raised areas around the eyes, nose and mouth. The last highlight is approx. 1:1 and is used on the tip of each brow, the tip of the cheeks and the tip of the nose. After the last step I used a fine brush to paint his eye sockets black, followed by bleached bone on the actual eye but being careful to leave a black outer rim for definition. Then it was just a case of adding a couple of dots for pupils and painting the teeth BB too. Using the SWG really works well with my army as they have the blue and grey armour, but the technique really works well with nearly any other scheme. No doubt there are other much better tutorials out there, but this is how i do my faces, so why not give it a try and see how it works out for you? 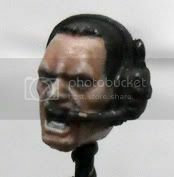 If like me when i first started, you struggle as to where you need or don’t need to put your highlights, i recommend taking a look on GW's site and their 'Eavy metalpainting faces guide (You need to be logged in to see the article) or having a flick through some of the articles on CMON. 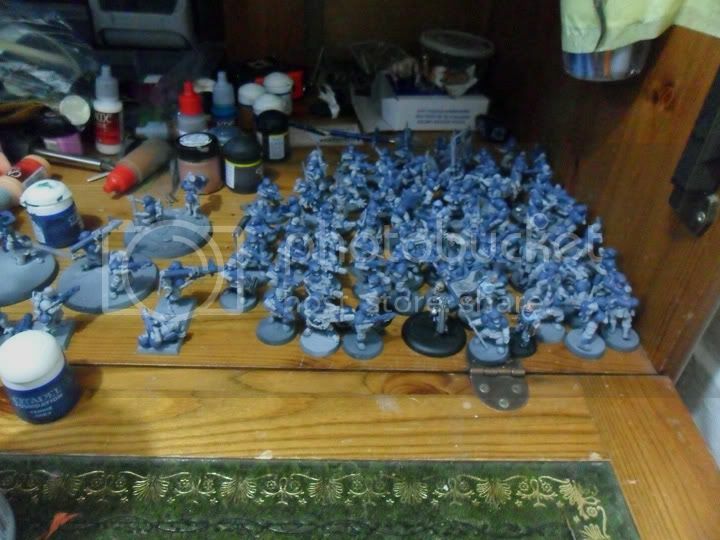 Anyway, i need to get back to painting lots of blue before A Game of Thrones comes on. 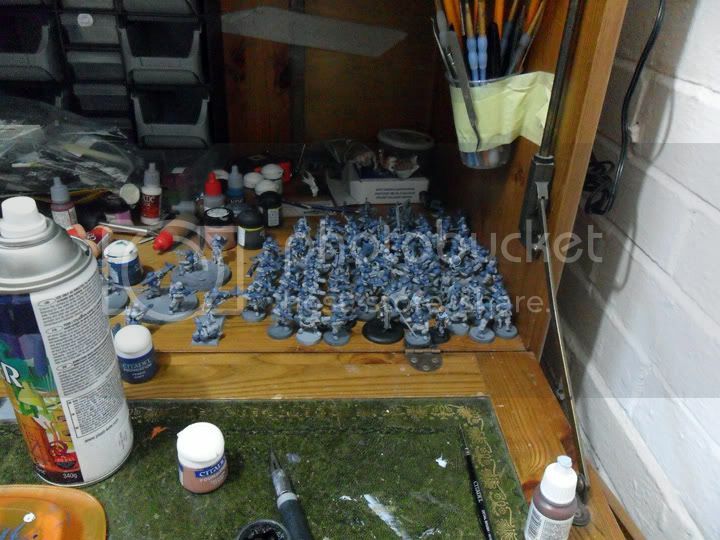 Great tips and photos- adding this to my list of painting bookmarks! I like it a great deal - simplicity is key, especially with Guard (although this is still way too much like hard work for me!). Thanks for sharing. Send it to Ron. it will be worth it in the end i hope!